The Thomas Bagnall Centre, in the Diocese of Galloway, is the unusual, integral building that is the church and house of Saint Mary’s in the picturesque village of New Abbey. New Abbey is situated 6 miles along the Solway coast from the town of Dumfries in the south of Scotland near the border with England. The building, which dates from 1824, lies within the precincts of the ancient wall of the 13thcentury Cistercian monastery of Saint Mary close-by, commonly known as Sweetheart Abbey. Sadly, after 188 years of church service, the last regular Sunday Mass was said by Bishop John Cunningham on Sunday 1st September 2013, it was a sad occasion for the local community and the Parish Priest Fr David Borland. As St Mary's is part of the Parish of Saint Andrew’s in the town of Dumfries, a vigil Mass is at 6pm and Sunday Mass at 10 am. Mass at St Mary's will however still be offered when visiting Priests come. The Centre is available for spiritual and pastoral uses for exclusive use for small groups within the Christian community and for those who just wish to spend some quality time with friends and family. Groups and individuals are welcome to come for a quiet stay or for their own organized retreat with a leader of their choice. It is available, on a self-catering basis, daily, weekends, Midweek or week. Accommodation for a group of up to 10 sharing three large bedrooms, two bedrooms have adult sized bunk beds and sleep 4 and one with two single beds. There are two bathrooms, a family bathroom upstairs comprising a bath, with shower, toilet and hand basin and on the lower level, a walk in shower, recently installed and suitable for disabled, a toilet and hand basin. Overlooking the front garden is a large spacious lounge with a an unusual curved door leading into the hall, a beautiful curved stairwell, a large family sized kitchen with electric cooker, fridge, freezer and microwave. A washing machine and tumble dryer are also available for use. A separate dinning/quiet room with access door to the church. 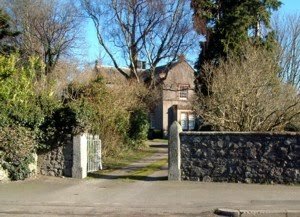 The house and church are situated within mature gardens - as seen in picture below - providing you with privacy from the road. New Abbey has two Inns, The New Abbey Arms which offers food and extra accommodation and The Criffel Inn. Restrictions: the Centre is a no smoking building, disabled access is very limited. The Centre is not run on a commercial basis, is non-profit making, and is available for a single overall charge and not on a per person basis. The price is inclusive of electricity, central heating, bed linen and towels, providing low cost breaks all year round. Donations are welcomed as we have to be self funding. See booking page for prices.